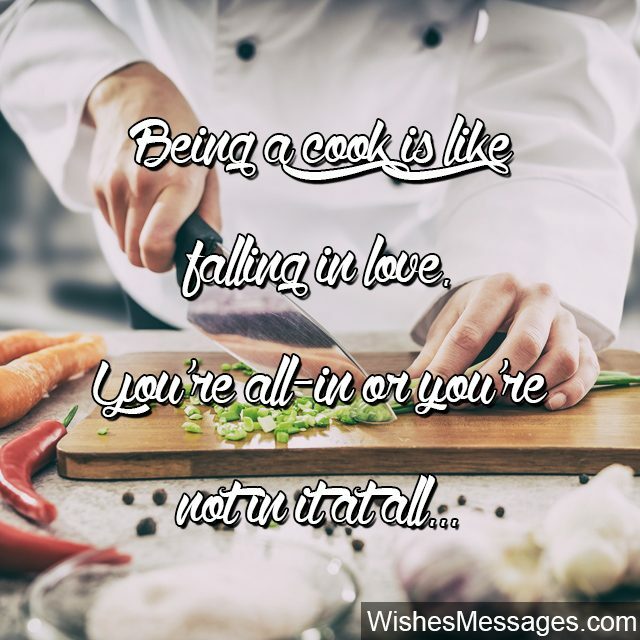 Cooking Quotes: Watching the inspirational life-stories of famous chefs on TV shows seems glamorous but in real life the job of a cook is a tough battle every day. Everyone, right from the kitchen-hand to the commis chef and the sous-chef to the head chef – running a kitchen is more than just following recipes. Cooking is about diving into the culinary world and working every day not just to learn from it, but also influencing it. Like they say, being in the food industry is not just about discovering new cuisines and ingredients but also about discovering yourself. This post is a shout-out to all the hard-working and passionate cooks out there who are fighting hard to excite taste buds in newer ways every day. 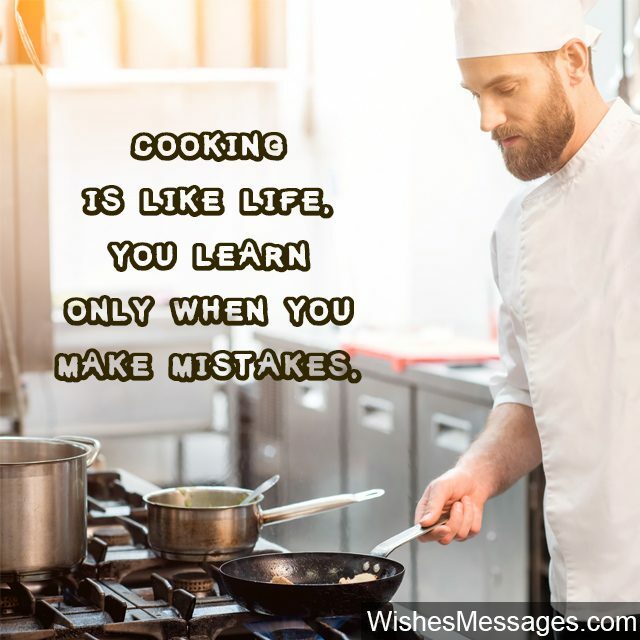 If you know an aspiring chef or just someone who loves food and the process that goes into it – these motivational messages will make them want to start chopping and dicing right away. 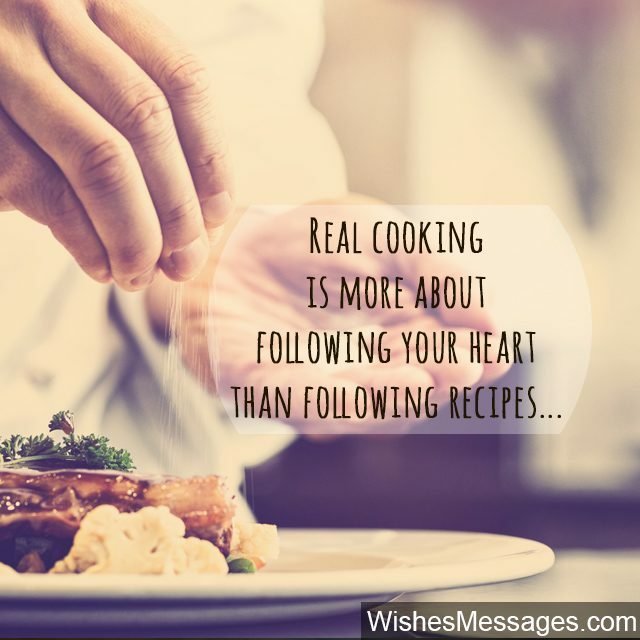 1) Real cooking is more about following your heart than following recipes. 2) Great chefs are those who not just understand a cuisine and its past, but also influence and steer its future. 3) You cannot be a good chef, until you are a great cook. 4) A great chef knows that great dishes are those that make great memories. 5) Cooking is not just a skill. It is a science – understanding how multiple things react to each other on the plate. It is an art – understanding how food interacts with the senses not just through taste but also visually. It is a business – understanding the economics of putting up a plate that makes money. It is a way of life – understanding what it takes to create and develop dishes that hit the soul. 6) Cooking is like life. You learn only when you make mistakes. 7) Anybody can copy recipes. But only few can create recipes worth copying. 8) It is a myth that the ingredient is the hero of the dish. The real hero is in fact, the desire to bring the hero out in the ingredient. 9) Cooks imitate cuisines. Chefs influence them. 10) Cooking is less about pleasing the taste buds of other people and more about finding excitement in surprising your own. 11) Being a cook is like falling in love. You’re all-in or you’re not in it at all. 12) The biggest mistake a chef can make is to think that food is supposed to be fancy. 13) Great chefs are made, not in fancy kitchens, but in a passion and way of life that drives people to see food as something that is more than just a hunger fix. 14) A good chef is someone whose relationship with recipe books is just like that between a race-car driver and the car’s driving manual. There comes a point when it is just a piece of paper. 15) Don’t make the mistake of believing that great chefs are born that way. Cooking is a skill and an art mastered over the years with just one simple ingredient – Hard Work. 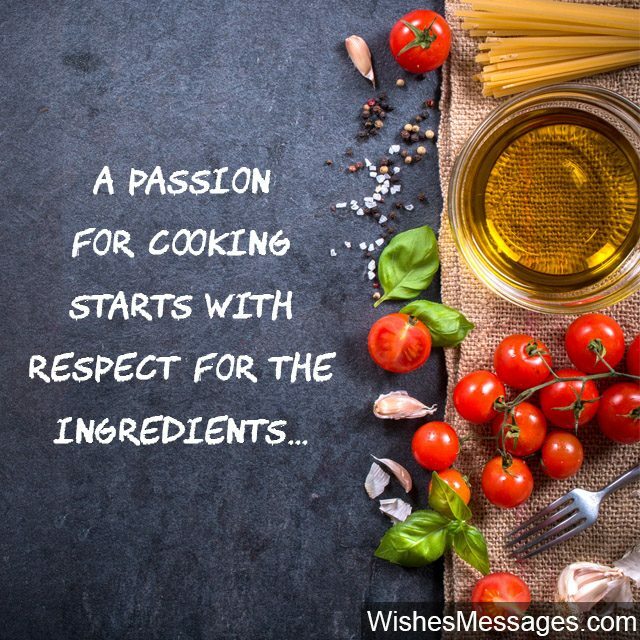 16) A passion for cooking starts with respect for the ingredients. 17) In cooking, there are no secret recipes. Legendary are those chefs whose work lives on in the form of imitation. 18) Being a chef is a thankless job. It is not as glamorous as they show on TV. In fact, it is exactly the opposite. Painfully long working hours in a hot and sweaty kitchen is no joke. If you are seeking fame, cooking is not for you. But if you are a tough nut to crack, if you believe in the Never Give Up attitude, if you are seeking happiness from watching people smile after tasting your creation, you’re in the right place. 19) The secret to being a good chef is to make a soulful connection with your ingredients. 20) A good chef understands, not just each ingredient but also how they will interact with each other on the plate. 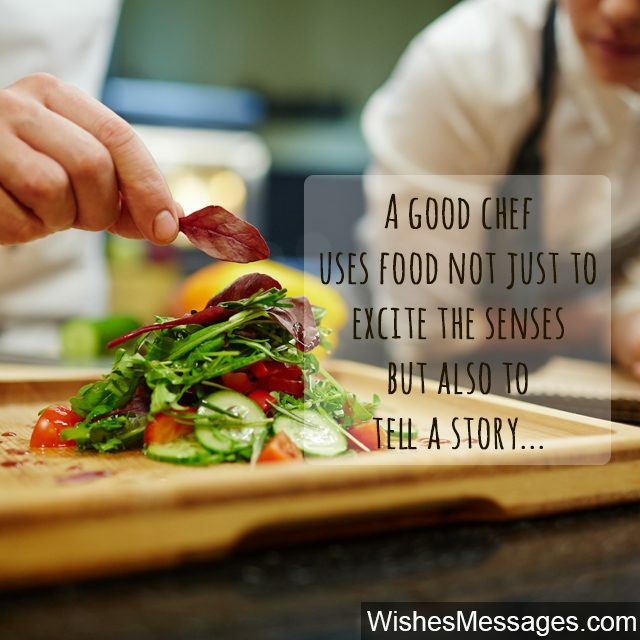 21) A good chef uses food not just to excite the senses but also to tell a story. 22) If you really want to be a great chef, stop talking and start cooking. 23) Kitchens are not a friendly place to be in. Only the fittest survive and the strongest move ahead. 24) A good chef understands the importance of the feeling happy after tasting a dish before it goes out to the diners. 25) A great chef is someone who can take ingredients and create dishes that invoke beautiful memories. 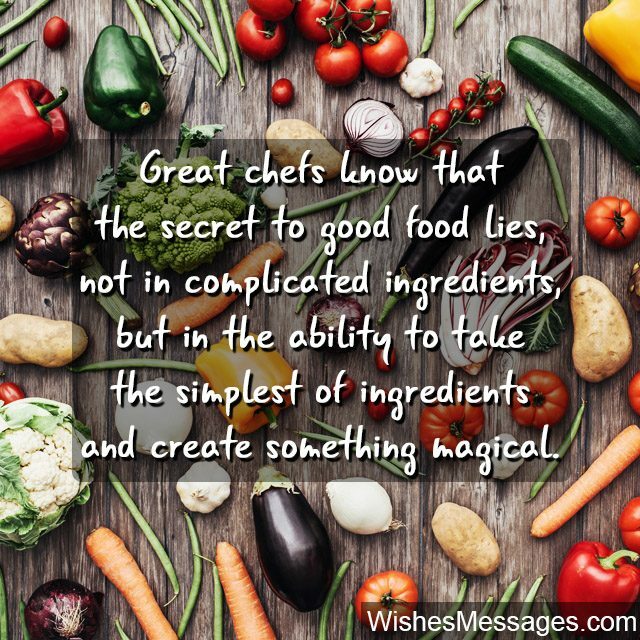 26) Great chefs know that the secret to good food lies, not in complicated ingredients, but in the ability to take the simplest of ingredients and create something magical. 27) Yes, cooking is a glamorous profession. Well, after you take out the slicing, dicing, chopping, cutting, filleting, cleaning, getting burnt, standing in front of flames for long hours, and heaps of other chores. Sarcasm aside, don’t let anyone fool you into believing that becoming a chef is a glamorous journey. It is a gritty ride and it is definitely not for the weak-hearted. 28) Inability to accept criticism is the beginning of the downfall of a chef, no matter how great or how famous. 29) It is easy to spot the difference between a cook and a chef. A cook simply uses ingredients, a chef treats them with care. 30) Learning how to respect your ingredients is the first step towards being a good cook. 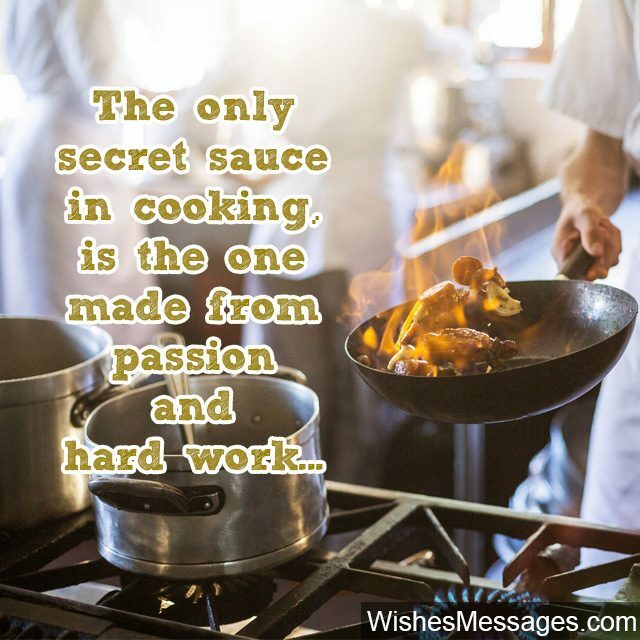 31) The only secret sauce in cooking is the one made from hard work and passion. 32) Trust your palette, trust your gut, trust your instinct and follow your heart – the best way to hone your senses as a chef. 33) A kitchen is not a great place to be in. It’s hot, loud, messy, sweaty and worst of all, fiercely competitive. Only the strong thrive in this environment which is why a lot of chefs are known to be rough taskmasters. If you can’t see yourself running the show and bringing rhythm to all the madness, maybe it is time for another career. If you can call this environment home, and love each and every moment – call yourself lucky because you’re one of the few people whose love for food overpowers everything else around you. 34) People who love cooking are those who know that good food isn’t only about the palette, but also about making memories. 35) Cooking is something that comes from the heart and the soul. If it doesn’t, you might as well as serve up mac and cheese.